Hanover Engineering provided wetland evaluation, land surveying, design, and monitoring services for compensatory mitigation for stream and riparian corridor impacts to Sobers Run, Little Bushkill Creek, and the Aquashicola Creek, including their riparian corridors and associated wetlands, as part of the Sentinel Expansion project located in Ross Township, Monroe County and in Bushkill and Plainfield Townships, Northampton County, Pennsylvania. The primary goals of the project were to mitigate for impacts to water quality and wildlife habitat at several nearby locations by creating a single large contiguous area of wetland and upland riparian habitat along Sobers Run. The Castone Property was selected as a viable site, having nearly four acres of impacted riparian corridor along Sobers Run associated with old pastureland. Hanover Engineering developed and prepared all materials required for a deed restriction, delineated all on-site wetlands and watercourse boundaries, and then completed the professional land surveying and filing with the Northampton County Courthouse. 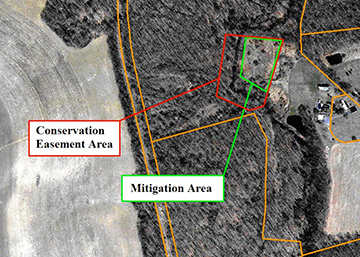 A planting plan for the mitigation area was developed using a combination of 175 native shrubs and 375 native trees to reestablish forested riparian conditions in wetland and upland areas and to benefit local wildlife throughout the 3.79 acre mitigation site. Infill by volunteer shrubs and trees from local seed sources figured into planning for long-term coverage. The site was treated regularly to control non-native plant species and reduce herbivore damage. Hanover Engineering completed all required monitoring for the site to document conditions and to ensure proper development.